Braised Chicken Legs With Shallots, Garlic, And Balsamic Vinegar. As is becoming the custom around here, I like to make food out of ingredients I already have in my refrigerator and pantry. 'I was at Trader Joe's, and they had a good deal on one-pound bags of shallots, and I thought to myself, 'surely I will find a use for these,' so I bought them. 'However, as much as I hate to admit it, I do this with many things, and end up throwing out a lot of food. 'I hang my head in shame every time I throw another bag of lettuce, or rotting lemons, or spongey and sprouting potatoes in the trash can. 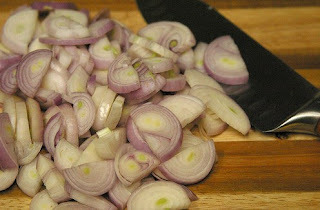 'Luckily, these shallots found their ultimate purpose. I made this recipe two weeks ago, before we went on our first vacation back to Nebraska in three years. 'I am still thinking about it and when I can make it again because it was so good. 'Oh, and did I mention it has bacon? 'Will that make up for me not posting in two weeks? As I recall, the only things I changed about the original recipe was that I used chicken legs, instead of cutting up a whole chicken. 'I also didn't bother to cook the bacon the way the original recipe indicated because instead of cutting bacon up before hand, I find it's usually easier to just cook it normally, and crumble it up later. 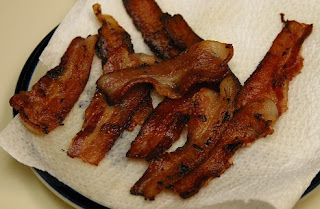 Cook bacon in a deep 12-inch heavy skillet over moderately low heat, stirring, until crisp, about 8 minutes. Transfer with a slotted spoon to paper towels to drain and reserve bacon fat in skillet. While bacon is cooking, pat chicken dry and season with salt and pepper. 'After the bacon is done, brown the chicken legs, beginning with skin sides down, in 2 batches in bacon fat over moderately high heat, turning, about 8 minutes. 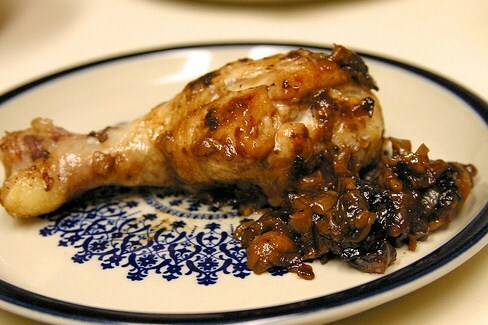 Transfer chicken as browned with tongs to a plate and pour off all but 2 tablespoons fat from skillet. Add shallots to skillet and cook over moderately low heat, covered, stirring occasionally, until soft and pale golden, about 10 minutes. 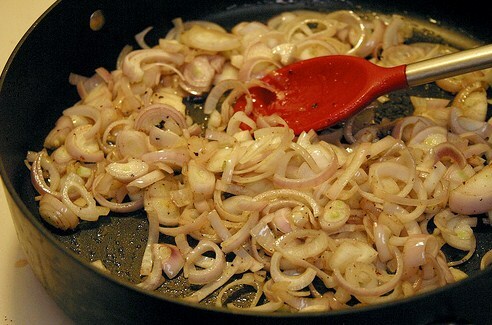 Remove lid and cook shallots, stirring, until deep golden, about 10 minutes more. Add garlic and 1 cup water to skillet and boil, stirring, 1 minute. Return chicken to skillet, turning pieces to coat, then arrange them skin sides up and gently simmer, covered, until chicken is cooked through and garlic is tender, about 30 minutes. Transfer chicken with tongs to a serving dish. Add vinegar to sauce and boil, uncovered, mashing garlic with back of a spoon, until slightly thickened. Season sauce with salt and pepper and pour over chicken, then sprinkle with bacon.